On a wall of the Total Petrol Station at the junction of Arundel Street and Holbrook Road. Harry, Ethel and Brenda Ayres; Doris and David Ball; Kathleen Barber; Emily Bartraham; Edward Bradbury; Harold, Ivy and Jennifer Brown; Robert, Beatrice Hawthorn and Beatrice Elsie Bushnell; Edward and Grace Cleeve; Caroline, Lily and Ethel Cooper; Kate Cousins; Joseph Cuddihy; Anne and Gwendoline Dagnell; Edward and Harriet Foster; Gertrude, Doris, John, Majorie and Donald Gordon; George Harris; Lilian Henrick; Doris, Emily and Raymond Hodgson; Rolinda Hounsell; Marjory, Phyllis and Brian Johnson; Dorothy Kimber; Ernest and Winifred Male; Arthur, Ivy and Dora Monkcom; Lucille Owers; Albert Paddon; Dorothy, Donald, Sylvia, Pamela and Frederick Pike; Rose Alice Ralph; Charlotte, Doris and Ivy Richards; Myfanwy Mary Rowland; Audrey Saunders; Lilian Slidel; Samuel Smith; Theodore and Kitty Stapley; Harry and Florence Stemp; George Tappin; Arthur, Ethel and Iris Taylor; Nellie, Pearl and Madge Tombs; Vera and Peter Tucker; Willamina and Lesley Watson; Sarah Wrigley. The inspiration for the plaque came from Robert Rowe whose mother was heading for the shelter when the heel on her shoe broke and she took refuge in a shop doorway. Her friend went on to join her family in the shelter and so died with them. The commemorative plaque was unveiled on 15th August 2011; it states that 80 people lost their lives in this incident but only 76 are named above. It is assumed that the remaining four were unidentified. This would not have been surprising as most of the victims were buried in a communal grave in Kingston Cemetery next to which are four plaques giving many of the names but also describing a number as 'unidentified'. It is perhaps surprising, given the enormity of this event, that there is still debate about the exact location of the air raid shelter. 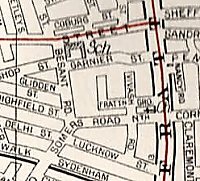 We can see from the pre-war map of the area (see left) that the school occupied the whole of the frontage to Arundel Street between Besant Road (now Holbrook Road) and Spencer Street (now Murefield Street). This is confirmed by the photo of the school taken from Arundel Street (see left). The school buildings therefore cover almost all of the land on which the petrol station now stands. The only space available for the shelter would have been in the playground behind the main buildings, perhaps 50m south of the current location of the plaque.